"315-Portage Bridge, Portage, N.Y., from east Bank." 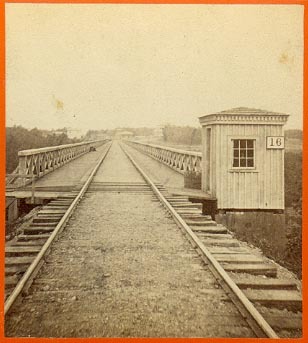 The photographer was standing on the western approach to the Portage Bridge when he took this photograph. On the near end of the bridge is a small structure for the bridge watchman, and to the left, one can see a railing marking a series of steps leading down from the bridge. Tourists, including perhaps Mr. Letchworth, used these stairs to reach lower levels of the bridge and the grounds below. Image 99 shows these stairs descending the gorge wall. In the distance one can see a dwelling to the north of the tracks, and the railroad station and Cascade House to the South.